"a delightful machine for leisurely pleasure but totally unsuitable for daylight bombing or indeed any kind of war mission"
The Martinsyde "Elephant" G100, a single-seat fighting scout, was large and unwieldy - hence one explanation for the nickname "elephant". Originally introduced as a long range fighting scout it proved unsuitable in this role and from 1 July 1916 it was used predominantly for bombing duties. 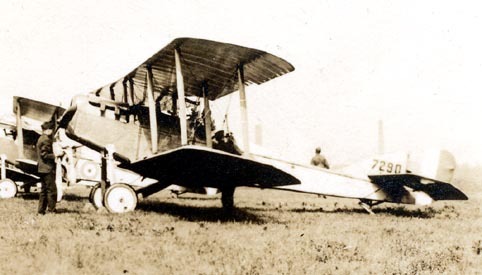 Oliver Stewart, a former Martinsyde pilot, described the aircraft as having many pleasing qualities though the outlook from the cockpit was restricted. Pilots of the time commented on its tendency to "float" on landing which Stewart attributes to the machine's clean design and low drag in comparison to other contemporary types. He described the controls as reasonably good though the ailerons failed to produce as quick a response as pilots would have liked. "The armament of the Martinsyde consisted of a Lewis Gun on the top of the plane with a long extension handle with which the pilot could bring the gun to the vertical position and so change the drum in flight. At first it was the small drum containing 47 rounds, but later there was a double drum containing 98 rounds. Spare drums were accommodated in racks inside round the pilots seat, and it was no easy job changing these drums especially the big ones, against the wind pressure. In addition we fitted a Lewis Gun on a simple mounting behind the pilots seat to frighten off an enemy on our tail, but this was really of very little use as it was not possible to turn round and fire it without very much affecting the control of the aircraft." Despite the final comment RFC Communiqué 42 mentions Major Smith twice using his rear gun during an engagement with EA on 6 July 1916, firing one and half drums of ammunition. Lt. Stuart Campbell who joined 27 Squadron in 1917 described the Martinsyde as "a delightful machine for leisurely pleasure but totally unsuitable for daylight bombing or indeed any kind of war mission". He described it as very slow and sluggish on the controls when loaded with bombs. On bombing missions the aircraft could take two hours to reach the typical operational height of 15,000 ft. Campbell commented that the only defence when attacked was to go into a dive and zig-zag for home. The Martinsyde G100/102 served with Nos 18, 20, 21, 23, 27 Squadrons in France and with Nos 14 and 67 in Palestine and Nos 30, 63 and 72 in Mesopotamia. No. 27 Squadron was the only Squadron fully equipped with Martinsydes. Wingspan 38', length 26' 6" (102 27'), height 9' 8"
Take off weight with full load 2424 lbs. Chaz Bowyer's 27 Squadron history "The Flying Elephants"